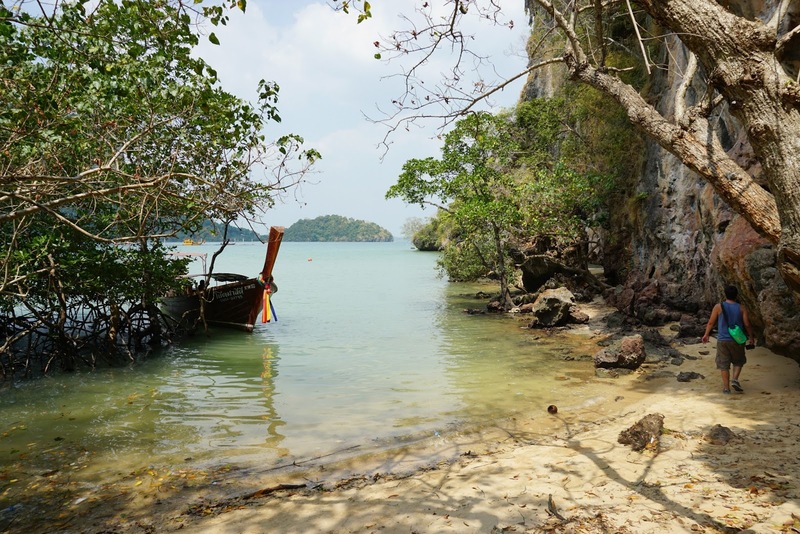 Due to the huge limestone karsts and surrounding cliffs it can't be reached by road, so we arrived by boat from Koh Lanta, taking around two hours. 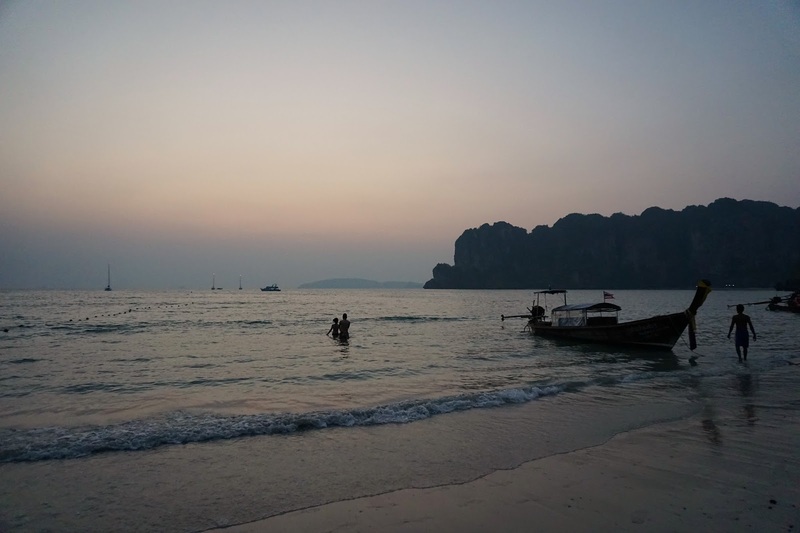 As the boat was too big to dock on the sandy beach, we hopped from our ferry to a small longtail boat which took us to the shore on the 'West' beach. Once again, it was one of those incredible moments when you jump down into the water, barefoot, the sun on your back and completely in awe of the beach in front of you! 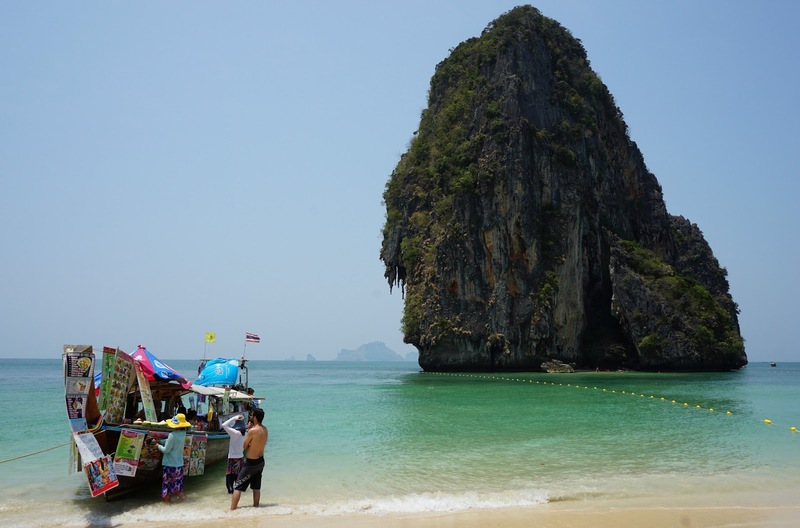 The rock formations and karsts protruding from the sea make it look almost mythical; so different from mainland Krabi. 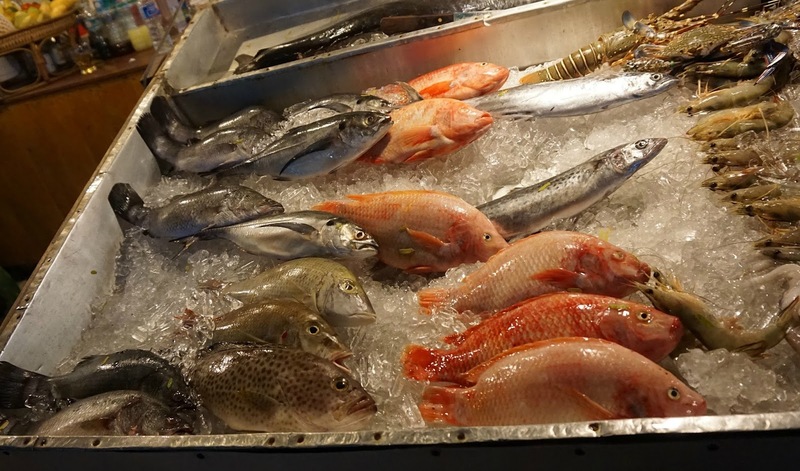 It really is one of those incredible experiences to visit - it's so less developed with ramshackle restaurants and fresh fish being barbecued street side. There are no cars, and the pace of life is far more relaxed. 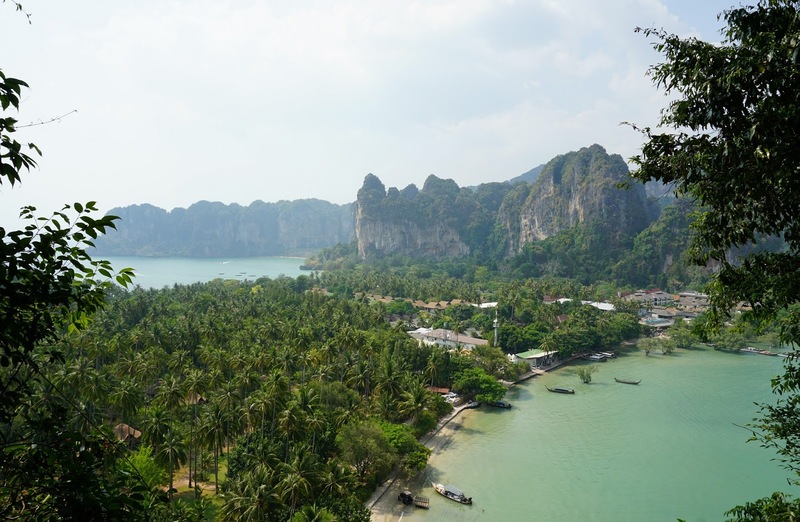 Railay has been known amongst backpackers for a while now, but it still feels far enough away, and more secluded, from the madness of Krabi town. 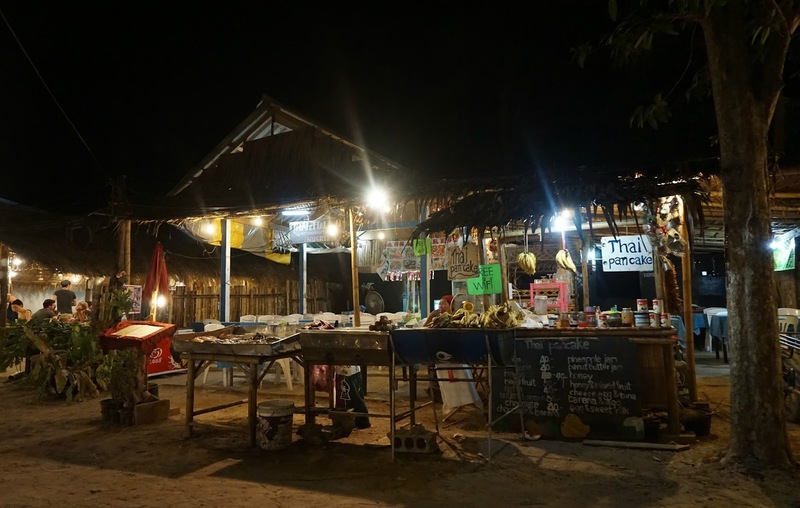 We decided to stay four nights on Railay, but met others who were just coming over for the day from Krabi or Ao Nang - it seems to be a shorter stop for most visitors. A note on transport on Railay. They have a longtail taxi service on east beach where you can get a boat to Ao Nang (mainland) for 100 baht a person. You do have to wait - there's a small shelter where you pay and then sit - for the boat to fill (eight people), however. On one occasion this took just five minutes, another occasion almost an hour. You can charter your own longtail, but this obviously costs more. Be prepared to haggle. We spent four nights at Railay Phutuwan Resort, which cost us £42 a night in March 2016 - I think it was on offer at the time. Located further back from the beach and up a hill, it's not for those who can't hack a bit of a climb. That said, we managed it whilst carrying our huge backpacks and carrier bags of beer and we were hardly the model of fitness after a good month of eating and sunbathing! 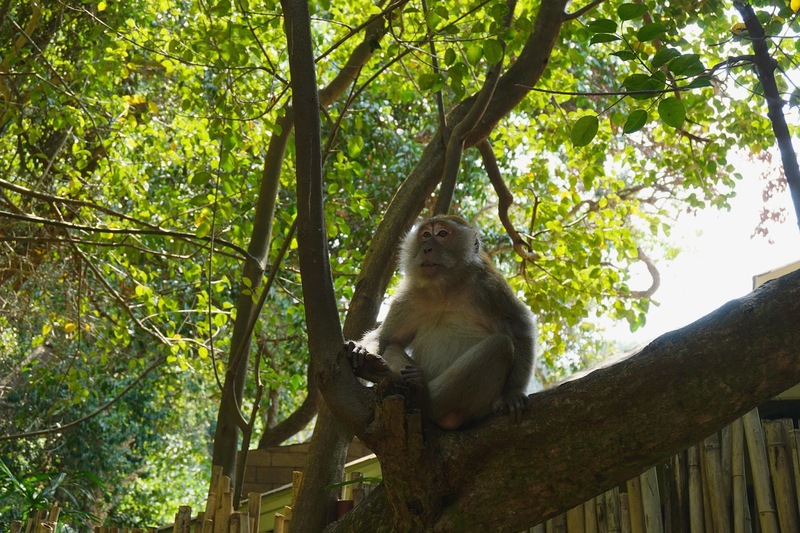 Watch out for the monkeys who have been known to wrestle carrier bags from unsuspecting victims! We stayed in one of the Tawan Villas which was right next to the pool, but still peaceful, with a super comfortable bed and good shower en suite. One of the draws for us was that they provide rock climbing lessons on the huge cliff face overlooking the swimming pool, which I will talk about more later. Speaking of the pool, it's ocean view is something quite special. Definitely one of the better views we had whilst whiling away the hours reading and dipping in the cool water to regain our sanity in the thirty-something degree heat. The breakfast at Phutuwan was excellent; a huge buffet with pancakes, waffles, eggs... the works! A real treat after some less-than-satisfying breakfasts on PhiPhi. 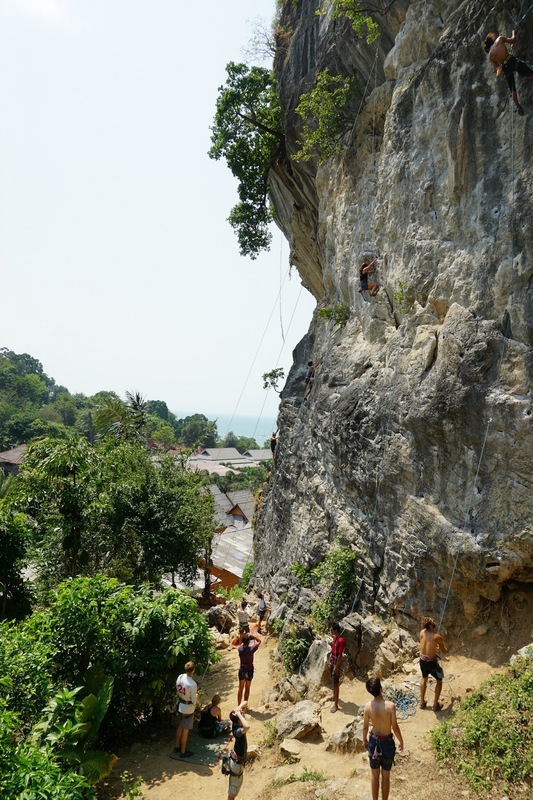 Go rock climbing - Railay is known for being the place to visit if you're in to rock climbing and bouldering. There are sites all over the east and west sides of the island offering courses, with something for most budgets. Feeling less adventurous, I opted for a morning of reading pool-side whilst Rich scaled the cliff face overlooking our resort. He paid 1000 baht (£20 in March 2016) for a half day's rock climbing which included full safety briefing, harnesses, shoes and proper equipment and guides. Of course, what with it being Thailand you're never fully sure of how rigorous the health and safety is, so I would advise you pick somewhere that looks a legit operation rather than just going for the cheapest option. Rich loved it, and if we could afford it he would have gone again and again. There are also outfits offering deep water soloing, where you rely on water at the base of the cliff to cushion your fall - no harnesses or ropes. We were told this sort of climbing is for those with a bit of experience, but looked incredible! Kayak - we were lucky enough to meet up with some friends in Railay who were on holiday there, and as a group decided to kayak round to Phra Nang beach. We hired our two-person kayaks from a stand on west beach for 300 baht (£6 March 2016) for two hours, and off we went! The water is so incredibly crystal clear, you can see fish from the kayak and we were able to paddle right up to the limestone karsts and go around and in-between - really amazing. 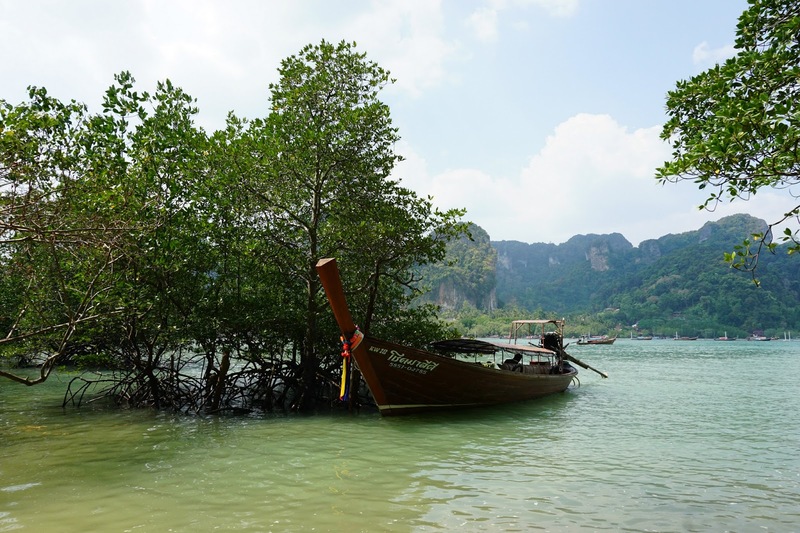 We paddled round to Phra Nang beach where we stopped for a bit and bought a drink from the floating boat - be sure to buy a dry bag to store your valuables and protect them from getting wet. See the viewpoint - up a steep track at the end of Railay east, you can see amazing views over Railay and beyond. 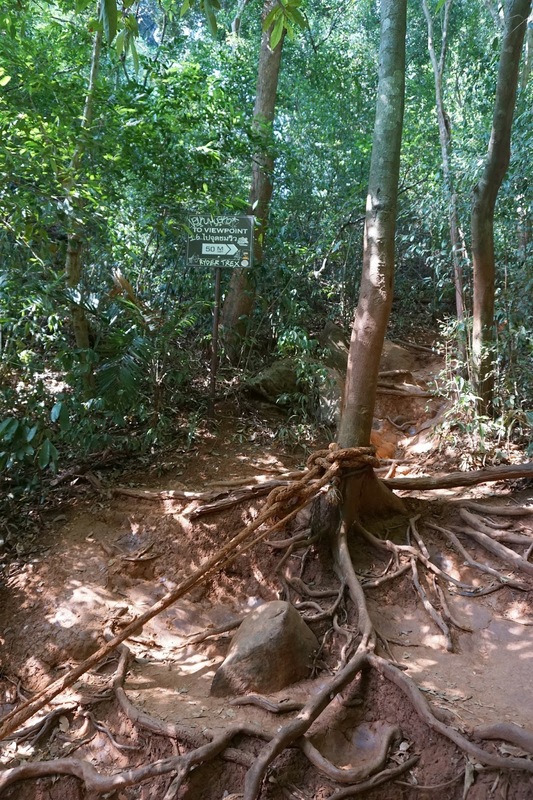 I say steep track which sort of undersells it... it's a cliff edge that you literally have to scale with the support of the odd rope and tree root. It's not for the weak-willed, and be sure to wear trainers and clothes you don't mind getting dirty. You will sweat, get covered in red earth and worry about your safety at times, but I promise the view is worth it. 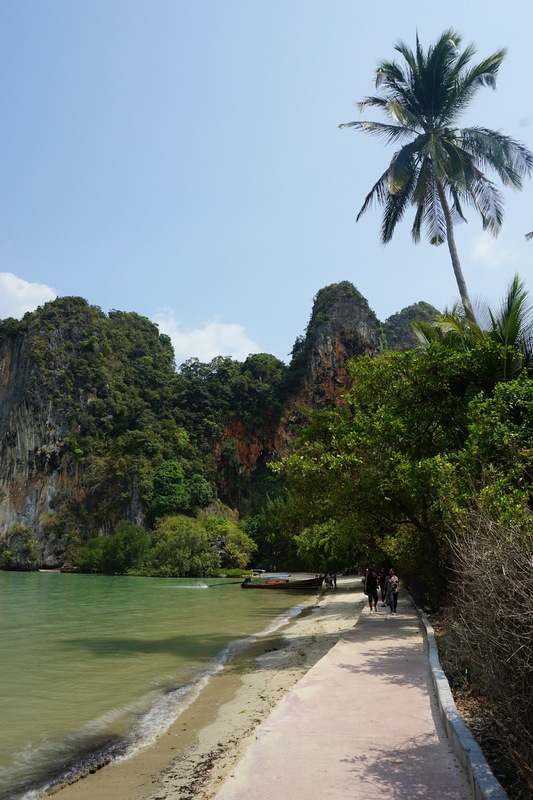 To get there you will need to walk to the east side of Railay, and to the right of the floating pier (Railay Sunrise Tropical end). Keep walking until you see overhanging rocks, and you will see a sign for the viewpoint pointing in to the rocks - yes, you hike up that! Not for the fainthearted. Apparently there is a lagoon you can also get to, but that is even harder to reach. Kohinoor - number one on TripAdvisor when we visited, this does good curries! The chicken saag may be an unnatural green colour, but it was delicious. 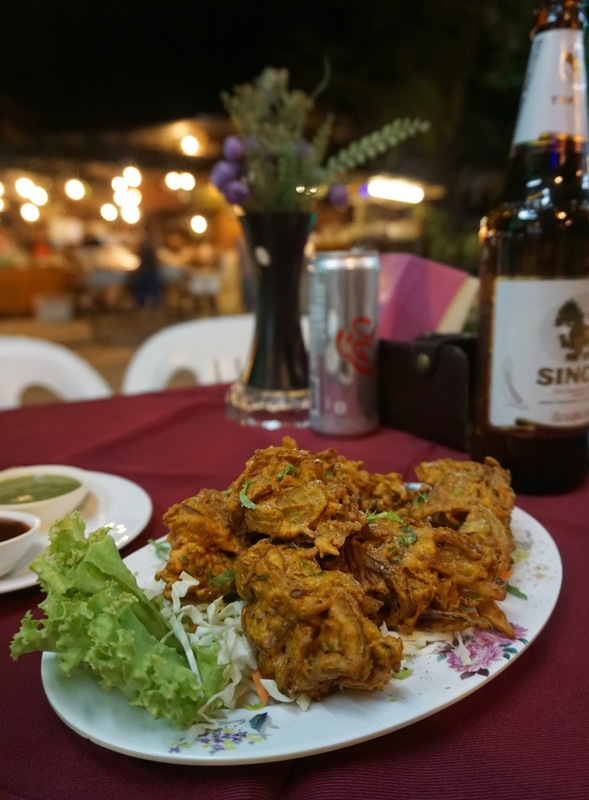 Be sure to order the onion bhajis. 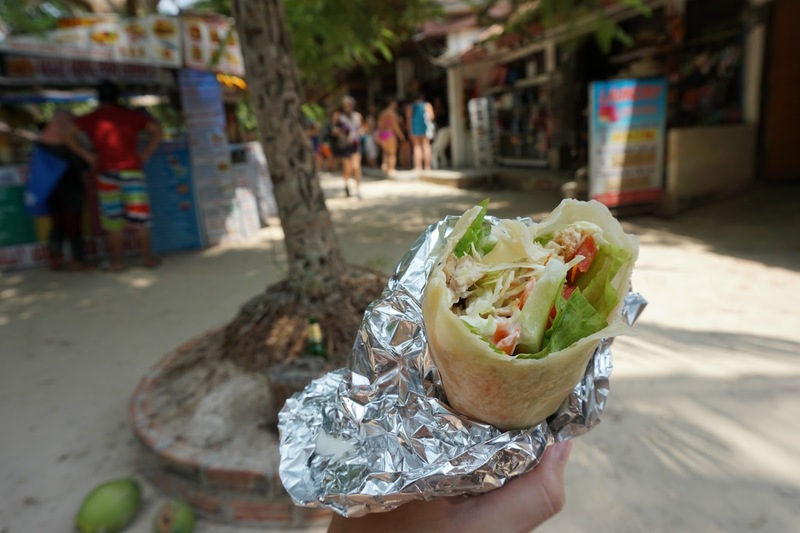 Wraps - unsure what this place is actually called, but it was on walking street (back from west beach) and sold 100 baht (£2) wraps with all sorts of fillings. Look for the place with the longest queue; you'll know its good. Mangrove restaurant - good freshly cooked fish and Thai classics, as well as two-for-one cocktails. 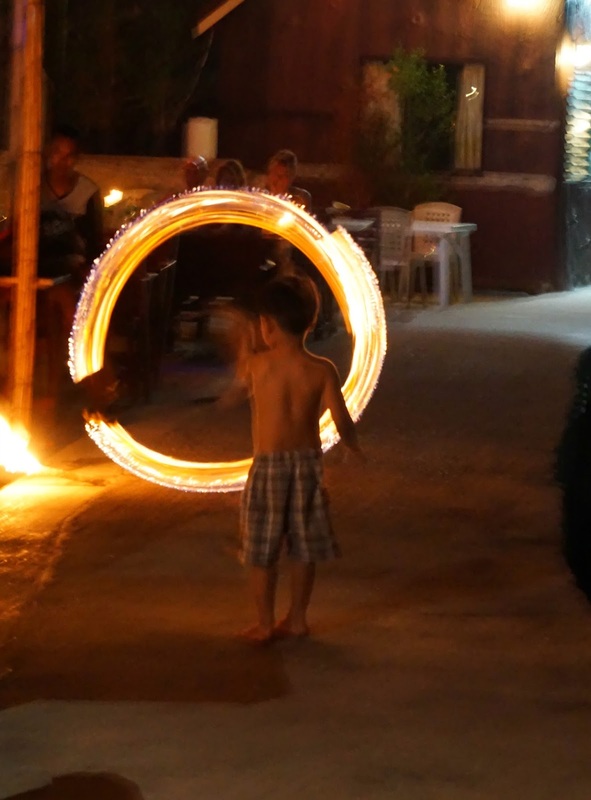 Railay Bay Resort - right on the west beach, it's a great location and good food. Try and go for sunset for magical views over the ocean. The Last Bar - drinks rather than food on Railay east, the opposite end to the viewpoint - good cocktails and entertainment including Muay Thai... and child fire-dancers. Yes, really.